Today I want to share with you an easy recipe that is perfect for a busy school or work night. This recipe pairs well with a dinner salad, fresh fruit and rolls. I love the super short ingredient list and that you throw it in the crockpot frozen! I love easy recipes, don’t you? 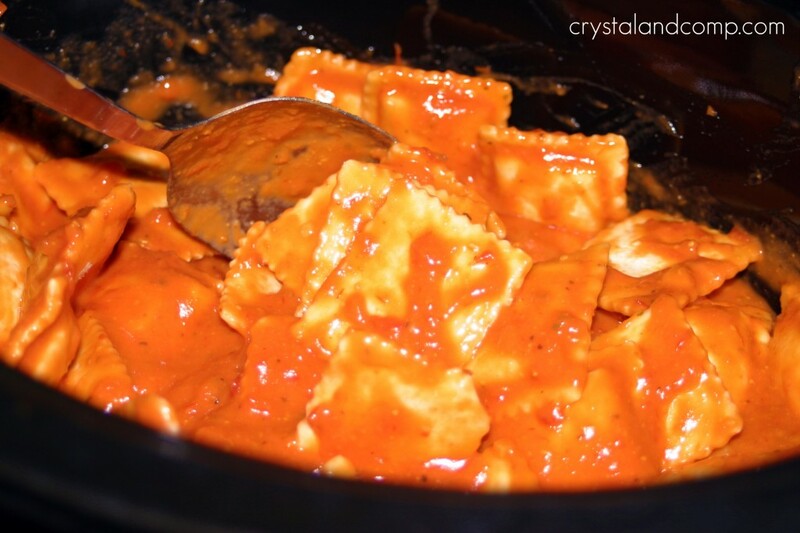 Have you ever made Crockpot Ravioli? Seriously easy! By the way, do you struggle with getting dinner on the table? I can teach you how to meal plan. Check out my eBook that teaches you step by step how to meal plan. I give you resources and solutions for saving money and time and getting dinner on the table for your family. 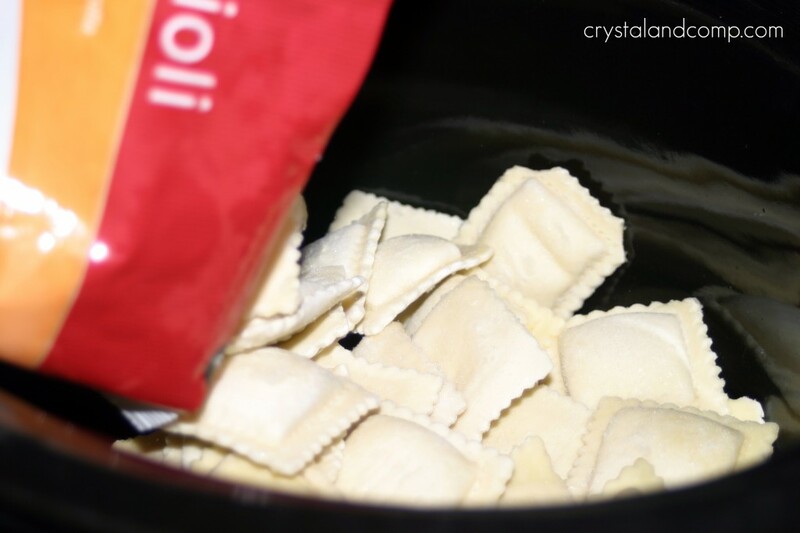 Dump your bag of frozen ravioli right into the crockpot. 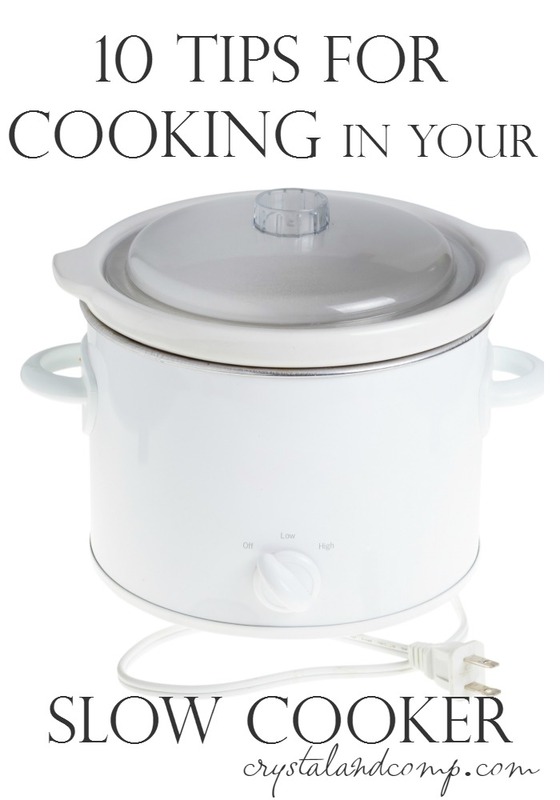 This is the slow cooker I use for this recipe and LOVE. I usually double the recipe. And you can use slow cooker liners if you want. Pour your jar of sauce over the ravioli. Stir the ravioli to evenly coat with sauce. Be careful, don’t chip a nail. I know this is strenuous work. Cover and cook on high for about 3 hours. Depending on how fast your crockpot cooks, you may notice they are done closer to 2.5 hours. You could also cook on low for a longer period of time. About 20 minutes before you are ready to serve, sprinkle the top of the ravioli with finely shredded mozzarella cheese. Pop the lid back on and let it melt- about 20 minutes. When it melts it will look like this. Plate it up and serve. How easy what that?! Want a meatier ravioli option? Check out my Crockpot Ravioli with Crumbled Italian Beef. Check out my How to Meal Plan ebook. 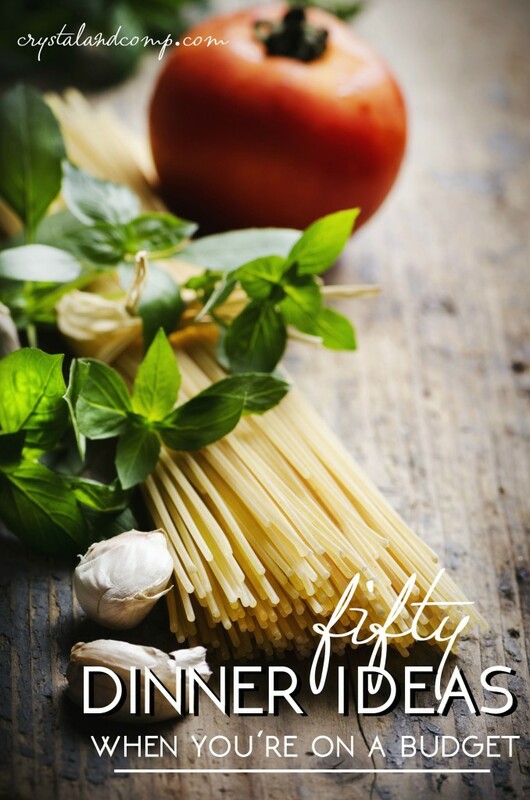 I will help you get dinner on the table for your family in five easy steps. 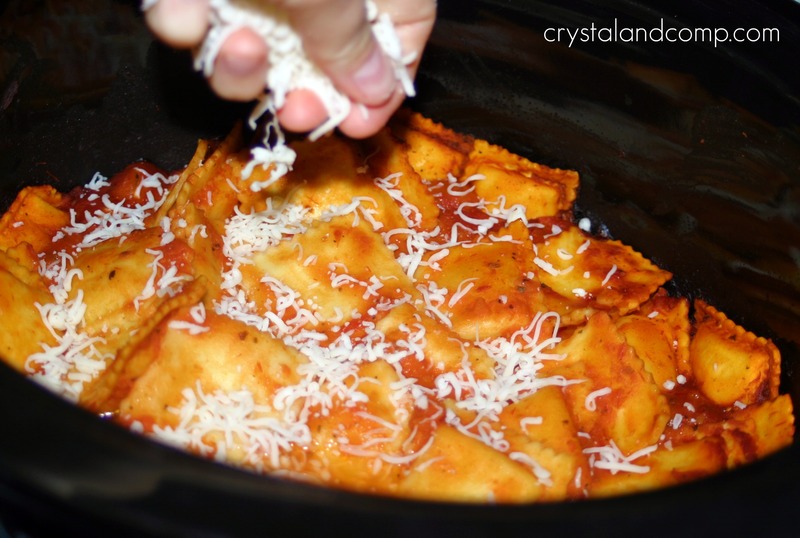 Dump your bag of frozen ravioli right into the crockpot. Stir the ravioli to evenly coat with sauce. Be careful, don't chip a nail. I know this is strenuous work. About 20 minutes before you are ready to serve, sprinkle the top of the ravioli with finely shredded mozzarella cheese. Pop the lid back on and let it melt- about 20 minutes. Once the cheese is melted, plate it up and serve. Genius! You put on your smartitude for this one. I will definitely be giving it a try! My toddler and I love cheese raviolis. This will make things so much easier. Thanks for sharing this. Super yum! I love easy recipes like this! Thanks! I love this! I’ve been looking for simple crock pot recipes. It doesn’t get any easier then this! Definitely sure to be hit. Can’t wait to try. This is incredibly useful. I would have never tried doing ravioli in a crock pot. Great on night tennis matches run late! Awesome, Trish. So glad this is a recipe you can use! Thanks for reading. I would have never thought of that. Perfect for the days when I know supper time will be rushed. Can’t wait to try this recipe! Pinning it and looking forward to making it soon – TFS! Yum. Does that look delicious. My favorite, easy and in the crockpot. Come over and visit us. We have a wonderful country rib recipe. This is a great dish and will keep our kitchen cool with everything in the Crockpot. It looks very good. Thank you so much for sharing with Full Plate Thursday and hope to see you again real soon. Hope you are having a great week! I’m definitely trying this for dinner. It’s too simple not to. And my favorite recipes of all time are the simple ones. Thanks a bunch! You just made making dinner a little easier this week! Well, that looks simple and yummy. Thanks for sharing. YUM. One more reason to love my crock pot! So smart. Thanks for sharing. I am trying to round up crock pot recipes to save my fragile sanity over the winter. Repinned to Pinterest just to be safe. Wouldn’t want to forget this one. Yum! So simple and so good! 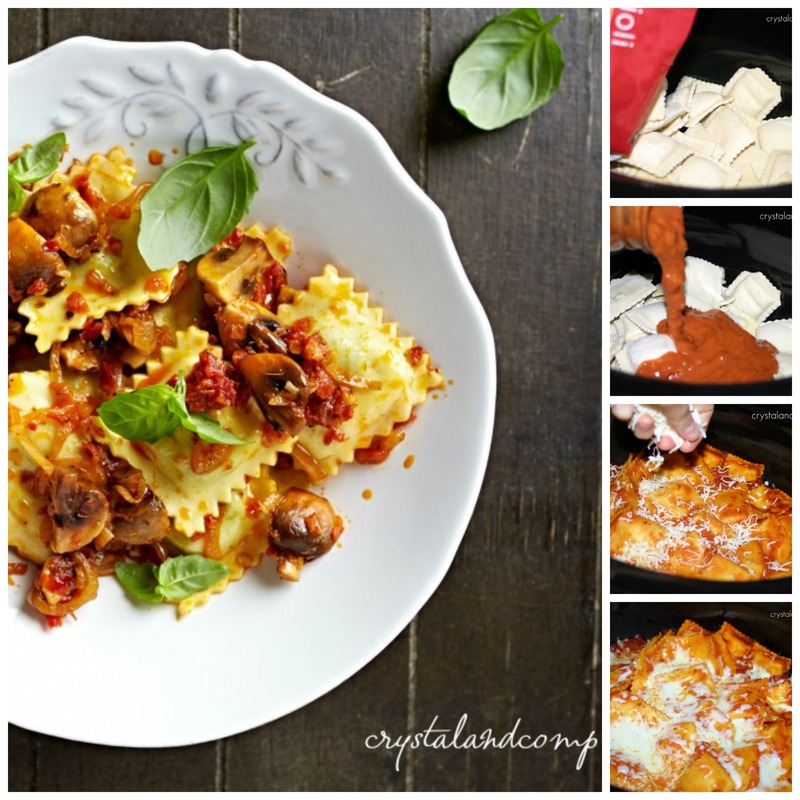 I would never have thought of putting ravioli in a slow cooker! Smart thinking!! This looks so tasty and easy! I’d love for you to stop by http://www.laughloveandcraft.com and link up to my Share the Wealth Wednesday Link Party! I have found your recipe through pinterest, and it looks so yummy. My question is: Where can I find the frozen ravioli? I have no idea where to look? Hi Kristian, the frozen ravioli are in the freezer section usually near the frozen lasagna and such. At most stores you can get beef or cheese filled ravioli. Sometimes you can find fancy options too with spinach or lobster, etc. Thanks for a quick and easy recipe. My sons practically slurped it up. My older son asked if I could make it again tomorrow night. Thanks for sharing and reading. Just found this recipe on Pinterest. I was looking for a super simple crock-pot recipe for my Zumba night this week, and I think I’ve found a winner! YUM. I love baked pasta\”¦yum! This is definitely a must try recipe. It is tasty and easy. Let me know what you think if you make it. I’m pretty sure I made this from your recipe last month! It was so good and a great way to have dinner on the table quickly! I also loved that the ravioli didn’t get soggy like it sometimes does when boiled! Awesome Henrietta! So glad you liked it and found that it got dinner on the table easily! Wendy- what an awesome variation! Sounds delish. Thanks for sharing. you said you can cook on low , but you did not say how long? Debbie- I have never cooked it on low, but I would bet it would be done in about 4-5 hours on low. These raviolis cook pretty quickly. The first time you cook them on low, you might want to do it on a day that you’re home so you can keep an eye on them. I would hate for you to be gone for 8 hours and them cook on low for that entire time and burn. I was going to make a different crockpot ravioli recipe until I saw this one. Going to give it a try for supper tonight. It turned out ok. I did add some hamburger to it. I may add 2 jars of pasta sauce next time,just seemed like 1 jar was enough. I made this using 1 bag of beef ravioli + 3 pint jars of our homemade spaghetti sauce, and cooked it on low for 7 hours while I was at work. The ravioli absorbed a lot of the sauce, and the ravioli was a “fluffier” texture than just boiling the pasta & putting sauce on top…delicious! You definitely shouldn’t cook it any longer (I won’t cook it as long next time, 5 hours would be plenty). I used the old-fashioned crockpot from the 1970’s, and it didn’t burn at all. My family & I loved it, thanks! Jan, I can my own spaghetti sauce too. Thanks for telling how much you used! Made this the other day and it was delicious! I will absolutely be making this again! It was unbelievably easy to make! Allyson– that is so awesome! So happy it made dinner time easier for you! My new “go to” recipe. Thanks! I made this tonight. 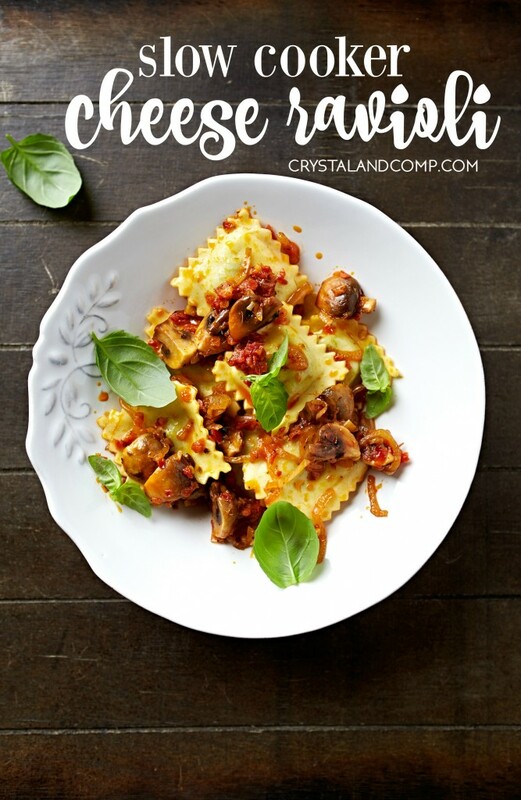 Normally, I do not use frozen foods; however, when I need to in the future, this will be a go-to recipe! My entire family liked it-even my picky 4-year-old! As it was cooking he said, “What’s that delicious smell?” haha! Anyway, I added frozen meatballs as well as homemade basil pesto (to doctor up that jar sauce!) and fresh thyme and basil leaves. It literally took less than 5 minutes to throw in. Will make again! Awesome Amanda! I am so happy to hear it was such a success. I love your add-in ideas! Hi, sorry for my english (I’m Italian..) I wonder if I can buy fresh ravioli ( less spicey then frozen ones…for my picky kids!! 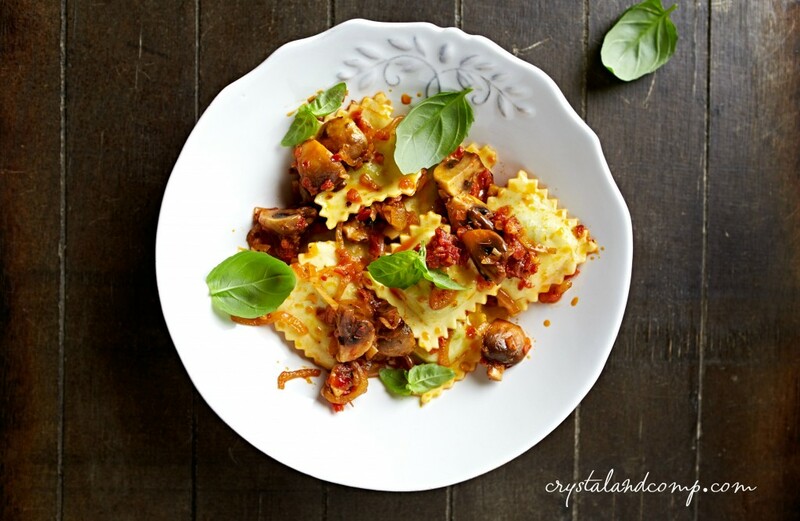 ), freeze them and then use them as “frozen ravioli” in the crockpot?? How long should it cook if I put it on low? I am looking for something that I can put in before I go to work and it be done when I get home (and not be burnt). I think it would cook in 6 hours on low. I have three suggestions. If you double the recipe it will take longer to cook and then you can have leftovers. So doubling the ingredients and putting it in a 6 qt crockpot could likely get you 8 hours on low. If that doesn’t work for you and you’re going to be gone longer than 6 hours for work, my suggestion would be to come home at lunch and throw it in the crockpot on low. Then dinner is still done when you get home. Or, experiment with it on a Saturday or Sunday to see just how long it can go on low in your crockpot. How could I do this in the oven? For the oven I would place the frozen ravioli in a 9×13 casserole dish. Cover in sauce. Cover in cheese. Bake on 350 until the ravioli are no longer frozen and the cheese is melted. i love your idea! can i use regular pasta? Hi I love this recipe and the fact that its so easy! I can’t wait to try it. I live in a dorm room so this is perfect to make! I do have one question though, I have a mini 2-quart crock pot. I’m clearly no expert but do you think this will work in my baby crock pot too? Absolutely! Just keep an eye on it the first time you make it in case it cooks too fast. Thanks so much can’t wait to try it! Excellent recipe. Thank you for posting! Excellent! I love the simplicity of this recipe, and it’s wonderful! I found it on pinterest, and my family LOVED it when I made it. I’ve had requests, so am making it again today. thank you! It’s my new favorite, and in the regular rotation! Pinning to save – to make soon! In The Crock Pot Now.. Perfect For A Friday Night Everyones Busy Meal. I Added Some Sweet Italian Sausage. Love your variation! Have an awesome dinner and thanks for stopping by. I’ve tried this with spaghetti sauce and Alfredo sauce and it has worked well with both. Just experiment with what you like! The recipe will be in my upcoming ebook which will share 21 Real Easy Recipes! Thanks so much for stopping by and linking up to the Dare to Share party. I am love quick and easy recipes llike this. You are the Dare to Share Feature of the Day. This looks delicious! Thank you for linking up to Inspire Me Wednesday. Featuring you in this week’s issue. What a great easy recipe. Thanks for sharing at Simple Supper Tuesday. It turned out dough-y and soggy for me 🙁 what brand are you using? I used the generic brand… Maybe that makes a difference. I always use the Target brand. I buy the cheese ones. Brand should not matter. What size crockpot are you using? Are you putting them in frozen? How long are you cooking them for? How much sauce did you add? What size bag of ravioli did you add? Mine come out perfect every time. I add one bag frozen ravioli to one jar of sauce. They are done in 2.5-3 hours. It has always been fail proof for me. I would love to help. 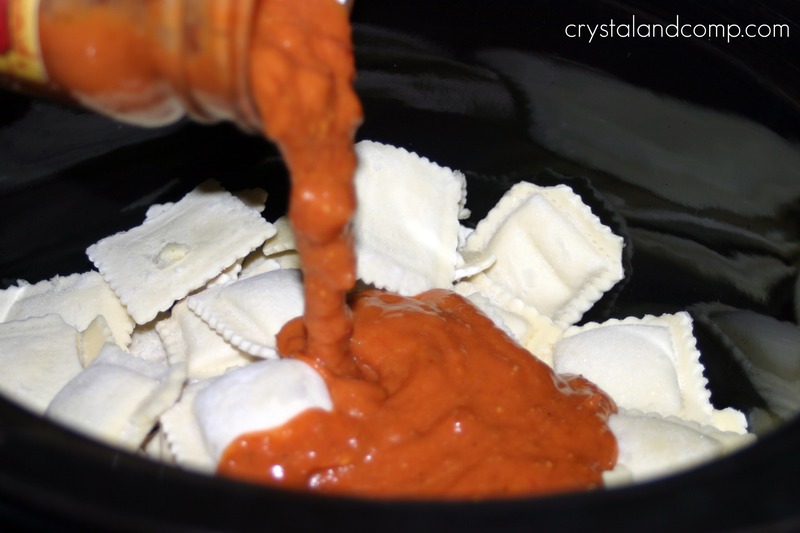 I never thought to use my crock pot for ravioli! Annie recently posted..Dollar Store Score! It is indeed! Simple and yummy! How many servings does this make? Have you ever used the meat filled ravoioli or added meat to your sauce? I have 2 growing “boys in the house who don’t think it’s a meal without some meat.”Thanks for a reply. This recipe serves 4-6. We double it often. You certainly can use meat raviolis, I just do not like them. So glad I visited your site, Crystal. These recipes are so easy, even I can do them. I not only cook for the grandkids, but anyone else who just happens to be around at supper time. Thanks for the great ideas. Sam- I am so glad you found my site too! I love meeting new people here on the blog and getting to know them. All of my recipes are easy- my schedule does not allow me to stand in the kitchen all day. Life is crazy busy. I hope your grand kids enjoy the Crockpot Ravioli. It is a family favorite here. I have another version of the recipe that involves adding crumbled hamburger meat. It is yummy too. You can get that recipe here: https://crystalandcomp.com/2013/12/crockpot-ravioli-with-crumbled-italian-beef/. I made this last night for dinner. turned out ok. I cooked on LOW for 3.5 hours. the ravioli cooks pretty fast. So you should keep an eye on it. It was pretty much done by 3 hours. 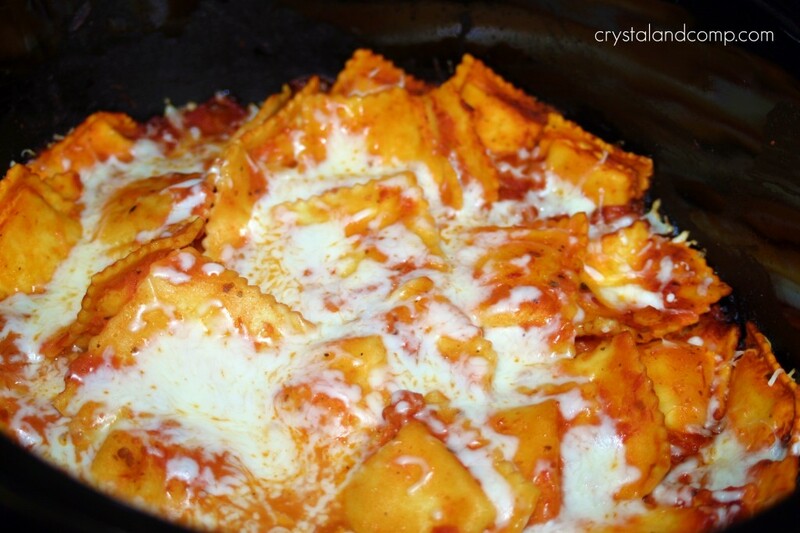 I had a bag of ravioli and wasn’t sure how to fix it -came across this on Pinterest and yet again you save the day. 🙂 So tasty and super easy!